A couple weeks ago I jumped at the chance to get a couple of books through Lulu after I had learned about what I thought was a limited time offer for 25% off. I bought a hard-cover for a game not even 10' after having paid for the PDF because what I saw was just begging for a hard-cover....more about that book another time, hopefully. 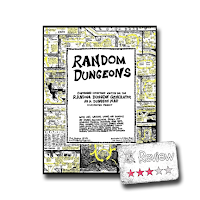 The other book I picked up was Random Dungeons, which appears to have been an add-on for a Kickstarter to have the Random Dungeon Generator as a Dungeon Map. This is the Dungeon Robber game I highlighted almost two years ago today. I loved playing that game and while I wanted the 36" x 24" map, the book looked pretty cool as it used the graphics of the map as the cover. The book is 180 pages long and letter sized (8 1/2" x 11"). 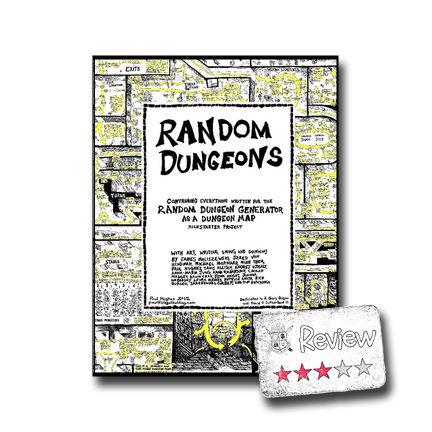 The 1st section has several pages devoted to reproductions of the Random Dungeon Generator and OD&D Illustrated Wandering Monster Poster. These graphics end up being quite small and the text is almost illegible. If I was to try and use them for playing a little solo pen and paper version of Dungeon Robber (which is the rest of this section) I'd want a magnifying glass. The next section is Paul's Dungeon Master Notebook. This is mostly some home rules and settings that initially I was pretty "meh" about, at least on my initial reading. The author did give credit for where some of his tips & tricks came from (mostly other blogs) and while the majority of this section would go unused by me, there were some good ideas and some rather simple tables that I think were pretty good. I think it'd really come down to the type of game you were playing. 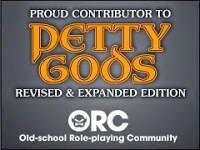 The last section is dubbed the All-Star DM Notebook and contains more adventure & game info from the author as well as five other DMs/authors. The info from this last section is all over the place because the authors pretty much had free reign. I particularly liked "Dungeon Building for Players: How and Why" by Tavis Allison. There are some free resources accompanying the article that I'll likely share in the next week or two. There are a couple of adventures in this section that are worth checking out. Normally when I pick something for review I give the item an initial thumb-through, only spending a couple of minutes at best....like maybe I'd be able to do if I was looking at the product at a game store. There are always a couple of things that jump out at me and far too often my initial impression is what I end up going with as taking the time to do a more thorough review simply reinforces my initial impression. I did not have a good initial impression about Random Dungeons. 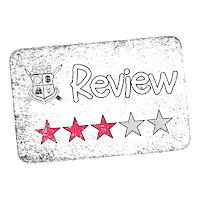 After the initial thumb-through I felt like I had wasted my money and I really didn't feel like going through the book again because of it. As much as I liked the initial Dungeon Map poster and Dungeon Robber which uses it, the way it was presented in Random Dungeons turned me off a bit. In general a lot of the graphics are shrunk down far too much in this book. Now if I actually had the poster, I could see me playing a solo pen & paper game of Dungeon Robber in a heartbeat. A lot of the game advice and adventures were things I probably wouldn't use myself, but even then there were some good snippets of info there that I'm probably going to read & re-read a few more times to figure out how to use in my games. I may very well just go as-is, but I'm assuming I'll need some tweaks to make it feel "right" for my table. One huge thing for me with this book, and part of why I was originally soured on this tome, is that it lacks a certain level of internal consistency and could have used more time spent on layout and editing. Different parts of the book, not just sections, but individual articles, use different fonts and layout. This results in a visually jarring presentation. I expect the art to vary depending upon the artists style and the written portions, even if edited by the same person, will show the author's "fingerprint" as well, but not laying things out to a standard makes the book disjointed. If I had picked this up in a game store I would not have purchased it after a quick thumb-through. I would have missed a few gems of info and links to some blogs and web-pages I'd be interested in.